Hello, We are David and Mariah Boatright and our two sons are Judah and Ephraim. This is our regenerative agriculture story. We both grew up on farms and wanted to one day raise a family in the country. We knew all about conventional agriculture but were disenchanted with the industrialization and coldness of the system that had become the new norm. I (David) watched as small farms disappeared and the message at farm meeting after farm meeting was to get bigger, farm more acres and buy more equipment. For me the math never added up. What was the end goal? Where would it lead? Why was a bigger tractor the solution to a farming system that couldn’t support a decent salary any way. The common lament was that there were so few young farmers, but I was simultaneously being told it was impossible to make a living full time farming. Mariah grew up on a factory chicken farm where she quickly lost interest in the packed houses, dusty conditions, and unrelenting pace of that factory farming system. We both wanted to raise our future family in the country but we were equally sure we did not want to conform to the conventional farming model. Then there was a spark. I learned how to graze on my family’s beef cattle farm. After being hit with a crushing drought in 2012, I began to search for a better way. Slowly I learned about restoration grazing. A system that improves the health of the land by using livestock to trample forage to the soil surface increasing organic matter and improving the water filtration ability of the land. I was excited. It seemed almost too good to be true. The system could in fact build on itself. Each year the land could heal more, grow more grass, and produce more food (harvested by beef cattle or sheep). I began experimenting with such a system on my parent’s farm and the results were remarkable. I was hooked. After we married we began managing a farm with a focus on regenerative grazing management and soil health. By using planned multispecies grazing and eliminating the use of harsh pesticides and herbicides we watched the land heal before our eyes. We were so excited! We had added sheep and goats to the system and were confident there was indeed a way forward for us to succeed in a non-traditional regenerative agriculture system. We now knew the incredible difference that a healthy soil and nutrient rich grass made for the animals but we had never considered the nutrient density (read that deficiency) of our own food. There was a disconnect between how we farmed and how we nourished ourselves. When shopping for food we just focused on price; what was the cheapest or “on sale”. We never stopped to consider how the food was raised, or the cost of the production system on the environment or on ourselves. What was really in our food? Why was it bland and tasteless? We never gave it a second thought. We were still supporting an agricultural system, through our food purchases, that we felt was unsustainable, and we were completely blind to it. Then the course of our lives took a dramatic turn. We were told we might never have children. For a newly married couple who had been dreaming of a large family in the country this was crushing. The doctor informed us that with Mariah's health condition conceiving would be incredibly difficult if not impossible without a lot of drugs hormones and a medical procedure. There suggestion was to "start taking a bunch of drugs just to control this and just come back when you are thinking about children." We are both people of faith and looking back we believe God used this to open our eyes to what we had been missing. Several months into the new "treatment" we decided we had to make a change after Mariah began suffering from some severe and bizarre side effects of the medication. At just this time we began learning about the benefits of nutrient rich food and clean eating. So we decided to try it. It was so slow at first we just picked one item in our pantry and freezer each week tried to replace it with a nutrient rich one. The first item we chose was beef. Then eggs, then apples, then .... We began to seriously consider the impact of our cheap eating. Why were we cutting corners on our food, that which has a direct connection to our health, energy, and vitality? So we started voting for regenerative agriculture with our dollar. We chose to support local farmers and sustainable regenerative production systems. It felt good to invest in our local community and farmers instead of in factory farms and faceless corporations. Sure it was more expensive, but a carefully crafted budget and a little sacrifice allowed us to become part of something more worthwhile than carefully crafted sale flyers and factory chicken. Then we took it a step farther, and we decided to raise our first pastured broilers. The flavor was incredible, darker meat with less fat and tons of flavor. We realized we were on to something. Next we raised grass finished lambs with the same delicious results. Then pastured laying hens which produced incredible eggs with a deeper color and heartiness. Lastly, we began grass finishing our own beef with the same delicious results. Simultaneously we were studying the health benefits of pasture raised livestock. We learned about the connection between healthy soil, healthy plants, healthy animals and healthy families. We also learned of the increased levels of Omega 3, CLA, and other beneficial nutrients in pasture raised meats. We were producing nutrient dense pure food and really nourishing our bodies for the first time in our lives. About six months into this we learned we were expecting our first child. Oh and did we mention Mariah quit her "treatment" when we started changing our diet. To say we were ecstatic doesn't even come close. We could hardly believe the transformation in both of us. Not to mention the fact that we would indeed be having a family! 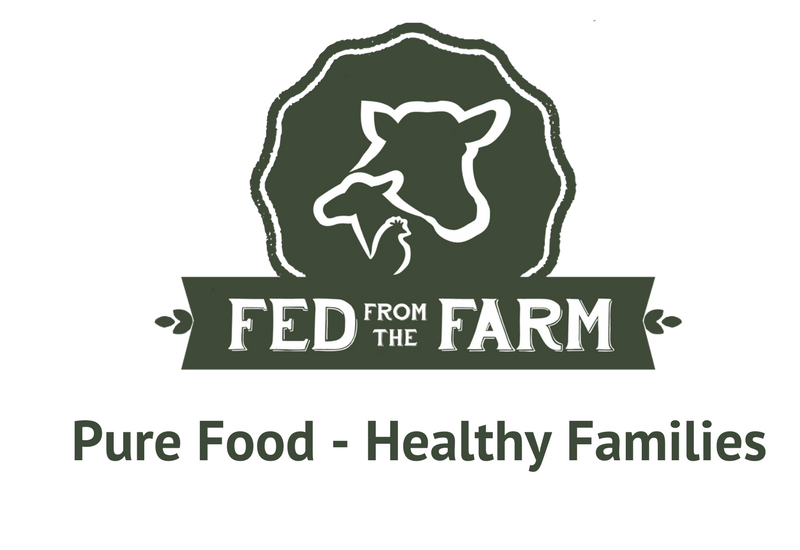 Then we made the decision to start Fed From The Farm so that the families in our community could experience and enjoy the same nutrient dense pure food that our family enjoyed. Our goal was to produce the best and safest food while giving families a genuine connection to the source of their food. We believe that the only truly sustainable farming system is one that harbors trust between those who steward the land and those who eat of its bounty. Today we have two healthy boys and see the difference that nutrient rich food makes for our family every day. We invite you to become a part of our regenerative agriculture story and to simultaneously begin your own.